This homemade insect repellent spray uses essential oils to naturally repel mosquitoes and other bugs. It also has ingredients to soften your skin, so you won't have dry skin or feel sticky after you use it. I've been waiting for summer since, well, fall. Why can't we just have spring, summer, fall, then summer again? Does anyone know where I can move to that stays between 68 and 72 degrees all year and isn't humid? No? I love the lazy days of summer, but I don't deal with humidity or the bugs very well. On Monday, I shared my insect repellent wax melts. They work great if we are on the patio. But we have almost 12 acres, so we aren't always on the patio. I made this homemade insect repellent spray with essential oils so we are covered all over the farm. We can also take it to the drive-in, to the lake, and everywhere we go this summer. We live on a farm, so we have bugs outside. I have noticed that we have fewer bugs the more chickens we have, but the chickens can't possibly keep up with all of the bugs. We also have four small ponds and the lawn is prone to flooding in certain areas, so yeah, we have mosquitoes. I've always hated the smell of bug sprays. When I was a kid, I remember the nasty smell and the spray dripping down my face when I'd start sweating. It got in my eyes and mouth, and I just hated using it. I wish I'd have known about essential oils then! My kids also used to fight me when I said it was time to get bug spray on. Now I make this homemade insect repellent spray with essential oils, and they don't fuss near as much. DEET, a common commercial insect repellent, is said to be safe for adults and children by the EPA. However, it can cause irritation, rash, swelling, and even nausea or vomiting in some people (source). DEET can enter your blood stream and can be found in your blood up to 12 hours after you apply it. DEET can enter the water. In high concentrations, it can be toxic to the fish and insects that live in the environment. I buy a premade blend from Crafty Bubbles called Insect Repellent. When I was researching blends to use, I discovered that I didn't have all of the oils on hand, so I went with this one. I'm glad I did because it's a great blend that really works well. You can also make your own blend of essential oils using one or more of the following oils. 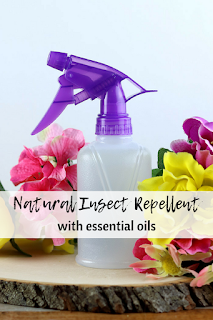 One thing to note is that when you make your own bug repellent with essential oils is that you will have to apply it more often than with commercial sprays. The oils evaporate quickly, so plan on taking the spray with you. I reapply about every hour. If the bugs are especially bad or I get sweaty, it could be more often than that. Lemon eucalyptus is a natural bug repellent and has been shown to reduce bugs. Crafty Bubbles Insect Repellent is 40 percent lemon eucalyptus. If you do make your own blend, I would use this in a higher concentration than other oils. Lavender essential oil is a relaxing oil, so it would be good for summer evenings. But it also helps repel mosquitoes and moths. Basil essential oil can kill bugs in the larvae stage to control future growth. In a spray like this one, it helps repel mosquitoes. Pine essential oil can be used to deter mosquitoes, but it can get overwhelming in a blend. Vetiver essential oil , like lavender, can be calming. It helps repel mosquitoes. Lemongrass essential oil is similar to citronella, and it works well to deter mosquitoes. Citronella essential oil is said to mask the scents that bugs are attracted to, so the bugs will leave you alone. It can help repel bugs up to three hours before you need to reapply. I used witch hazel as part of the base of this recipe because it has so many skin benefits. It is naturally anti-inflammatory, so if you do get some bites, it can help reduce inflammation and swelling. It's also nourishing for your skin and can make it feel better. Apple cider vinegar helps restore your skin's pH balance. It helps reduce excess oil and smooths your skin. The alcohol serves two purposes. It acts as a preservative, which is especially good if you use distilled water. I used 91 percent rubbing alcohol , but you can use a lower percentage. I just keep the high percent around to sanitize makeup for the theater. You can also use vodka. You can use a low grade vodka for this recipe; no reason to use the good stuff. Both the glycerin and fractionated coconut oil are to nourish your skin. I used the coconut oil because I am out of glycerin, but glycerin would be best. Essential oils and water don't mix. The oils will float right to the top. Glycerin isn't the best ingredient to use in an emulsion to mix oil and water, but it does help disperse the oils throughout the water, and it also helps your skin. If you use oil, you'll have to shake this before you use. it, but it will still work fine. Normally, I would recommend glass for any project with essential oils. However, I don't allow glass on my patio. My kids love to be barefoot, we have dogs, and the chickens go to the patio. I don't want to have broken glass on my patio and have someone step on it, so glass is a no no for this recipe. You could also get small spray bottles to have several of these at once. I keep one in my car for impromptu summer nights at the park or at the drive-in movies. One bottle pretty much stays on my patio table, and there's one stashed in the barn. Pure vanilla extract naturally repels flies, gnats, and other bugs. It's also said to help boost citronella's effect. This is optional, but I did add it. Combine all ingredients in a spray bottle. Shake well. Apply to exposed areas of your skin. Shake well before each use. Reapply as needed. No bug spray will protect your from 100 percent of bugs and mosquitoes. If you do get bit, try this anti-itch solid lotion stick to stop the itch and help reduce inflammation naturally.